Muscle Man Do Du think Muscle Man's "My Mom Jokes" are halarious? 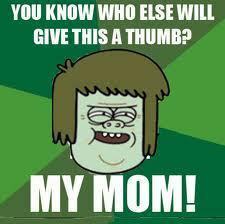 Is Muscle Man your favorite character in Regular Show? Do you think Muscle Man looks cool? Are you a party hard person like Muscle Man? Do you think Muscle Man should be a different color, rather than a navy green? Do you think Muscle Man will ever be nicer?